Baba Bhuman Shahji, the beloved Gurudeva of Shri Chandra Swamiji, was one of the great spiritual sages of the eighteenth century. His whole life was dedicated to the ceaseless remembrance of the Divine, selfless service of the poor and needy, and to awakening people from the hypnotic slumber of attachment to worldly and temporal pursuits. Although Babaji lived more than 250 years ago, to this day he has thousands of followers around the world. Shri Chandra Swamiji has had the rare priviledge to have been spiritualy connected with Babaji for many lives and be guided by him to the final goal of God-Realization, even several centuries after Babaji shed his physical form. As a tribute to Babaji's spiritual legacy and unlimited grace, Swamiji has written a small booklet "Mirror of Bliss" containing a brief introduction to Babaji's life and his teachings in condensed form. The following details of Babaji's life are taken from this booklet. Babaji was born in 1687 in Behlolpur village, Punjab, which is now in Pakistan. His parents were deeply devoted to the renowned sage and exponent of the ancient Udasin lineage, Acharya Shrichandraji. Eleven days before Babaji was born, his mother began having many wondrous dreams and visions of Acharya Shrichandraji. These blissful experiences convinced her that the child within her womb was no ordinary being, but a divine incarnation of Shrichandraji himself. Indeed when the child was born, there was an irresistible divine glow on his face which attracted people from many neighbouring villages to see for themselves the spiritual splendour of this newborn baby. His parents gave the child the name Bhumia, who later became renowned as Baba Bhuman Shah. At a very young age Bhumia showed a preference for the ascetic and contemplative lifestyle, and would often remain absorbed within in deep meditation. As Bhumia grew up, extraordinary supernatural powers began to unfold in him spontaneously. But Bhumia, unassuming and humble as he was, would only say, "These things happen spontaneously through the divine power of the Lord. I don't do anything myself, nor do I intend such things to be done." Meanwhile Bhumia's father sent him to a local school run by a Panditji (priest). During his studies Bhumia would ask the priest such intricate questions about God that the priest could not answer him. Seeing Bhumia's deep aspiration and longing for God, the priest became convinced that the boy was not an ordinary soul. By the age of 13, the aspiration to become a monk had become very strong in Bhumia's heart. After obtaining permission from his parents, he went to the town Pakpatan, situated about 30 kilometers from Deepalpur, to the ashram of the great Udasin saint Baba Pritam Dassji and humbly requested the sage to give him initiation. Baba Pritam Dassji immediately recognized the spiritual greatness of the young Bhumia and initiated him into the Udasin denomination of monks, thus changing his name to Baba Bhuman Shah. Having spent some time in the service of his Gurudev, Baba Bhuman Shahji came to the village Kutub Kot, situated between Pakpatan and Deepalpur, and stayed in the forest near a well on the outskirts of the village. The news of his coming and staying there spread like wildfire and the aspirants of all faiths — Hindus, Muslims, and Sikhs, thronged to see him. 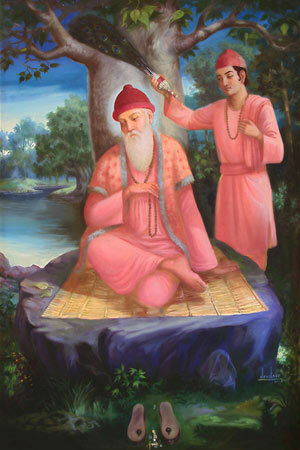 Babaji was continuously surrounded by devotees and seekers. The personality of Baba Bhuman Shahji, soaked as it was in the love of God, radiated a very strong spiritual magnetism. Most of the people would feel inexpressible contentment and joy in being near him. Everyone who came to him with any desire would be blessed and would return contented. Such was the divine personality of Babaji, that all the divine qualities of a God-Realized saint, as mentioned in the holy scripture, were present in their fullness in him. The supernatural powers described in the Yoga Sutras of Patanjali were also completely manifest in Baba Bhuman Shahji. Though on certain rare occasions he wilfully made use of those powers in order to generate faith in God amongst the people, he would not display these divine powers to gain cheap popularity or material benefits. He was a very unassuming, simple, quiet and modest sage. The Muslim landlord of the village Kutub Kot was one of the many people deeply touched by Babaji's divinity and grace. After a series of miraculous events, he donated the entire village to Babaji, thus changing its name to Bhuman Shah Village. Eventually Baba Bhuman Shahji moved from the forest to a place inside the village where he started a free kitchen for the poor and needy. By this time, thousands of people including people of all religions had become his devotees. Many of these devotees would offer the rations and other materials necessary for running the langar (free kitchen) and would serve him with all the resources at their disposal. Babaji would teach them to be pure and honest in their lives and would inspire them to remember the Divine regularly with unbroken zeal and trust. He used to tell them the gist of all the scriptures in these simple words, "Feed the poor freely and serve them humbly. At the same time, remember the Divine with unbroken continuity, and also reflect and contemplate on the essential nature of your Being. This is the code of conduct of a true seeker of Truth." The true teaching of Babaji was, as a matter of fact, his own exemplary life filled with the ecstasy of spiritual joy, and dedicated to the selfless service of humanity. 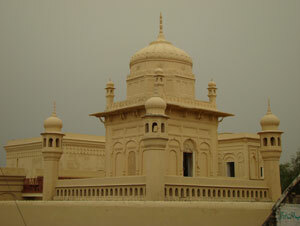 The samadhi (sacred shrine) of Baba Bhuman Shahji, now in Pakistan, renovated and declared a heritage site by the Pakistan Government in 2008. Thus, living the life of an enlightened sage, Baba Bhuman Shahji shed his mortal sheath in December 1747, and merged his soul in the timeless, eternal, divine Godhead (Brahman). Seven days before leaving his mortal body, he applied tilak on the forehead of his most senior disciple Baba Nirmal Chandji in front of all his devotees and declared him as his successor. In the lineage of Baba Bhuman Shahji, Mahant Darshan Dassji and Mahant Harbhajan Dassji were two spiritually powerful and enlightened sages who occupied the seat of Mahant (head of the Dera). Shri Chandra Swamiji's grandfather, Lala Lakshman Dassji, and his parents had great reverence for Baba Bhuman Shahji and it was into this rich spiritual tradition that Shri Chandra Swami was born in the village of Bhuman Shah in the year 1930. After the country was partitioned on religious grounds between Hindus and Muslims in August 1947, Bhuman Shah Village went to Pakistan and most of the Hindus had to flee from Pakistan to save their lives. After migrating to India, the Hindu devotees of Baba Bhuman Shahji built numerous temples in the sweet memory of Babaji in different states of northern India, where daily worship is offered with faith and love. Today, through Shri Chandra Swamiji, the name of Baba Bhuman Shahji has spread among a large number of seekers from different parts of India as well as from different countries.